Yesterday the husband was off and the calendar was free so we decided to spend the early part of the day poking through some not too far from us antique and vintage stores. We visited one we had visited in the past and then stopped at a couple that were new to us. 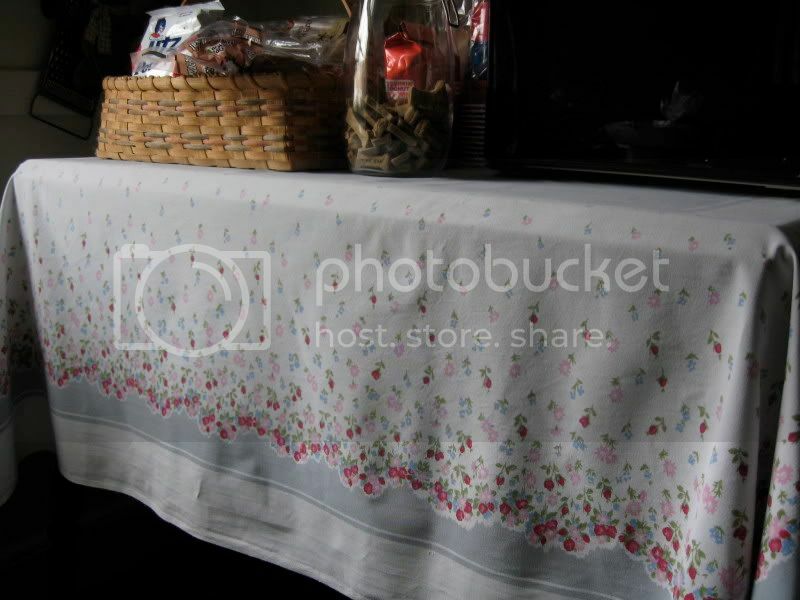 I am a sucker for vintage heavy cotton tablecloths. I use this one all the time in my kitchen. In one of the new to us stores I saw so many things I would have loved to buy but when I saw the above tablecloth it moved right to the top of the list. 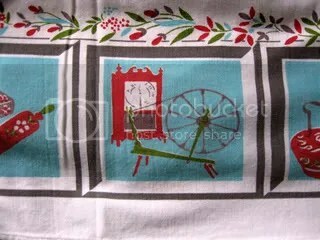 Look it has a spinning wheel on it! It will be perfect for alternating with the other one. This entry was posted in Guilty Pleasures. Bookmark the permalink. That is too cool! I never find stuff like that when I go poking around antique shops. Wonder if it’s a New England sort of thing. You’ve got older stuff out there.